The Class of 1966 has gripped hands with members of the Class of 2016 since their March Back from Beast Barracks in August 2012. '66 had accompanied the cadets at their Acceptance day, Crest Unveiling, Yearling Flag Ceremony, Cow Affirmation Ceremony, Ring Weekend, and Branch Night. The U.S. Military Academy Class of 2016 graduated and commissioned as second lieutenants into the U.S. Army May 21, Nine hundred and fifty-three cadets, which represented approximately 78 percent of the cadets who entered West Point in the summer of 2012. Vice President Joe Biden was the graduation speaker. This was the 218th graduating class of West Point. This class included 151 women, 77 Hispanics, 71 Asian/Pacific Islanders, 69 African-Americans and 12 Native Americans. The class also had 25 combat veterans (24 male, one female). Members of the class of 1966 presented new graduates with their second lieutenant bars as their final duty of the 50-year affiliation program. 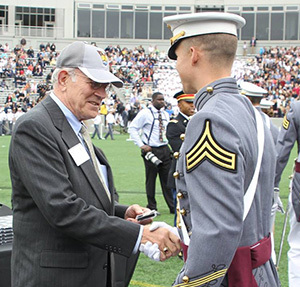 Honorable Michael Wynne '66, LTG (Ret) George Crocker '66, Mr. Robert Cresci '66 and Mr. Peter Braun '66, Class President, distributed the bars. The bars are engraved with “66-16” to commemorate the special bond between the classes. READ MORE | PHOTOS.